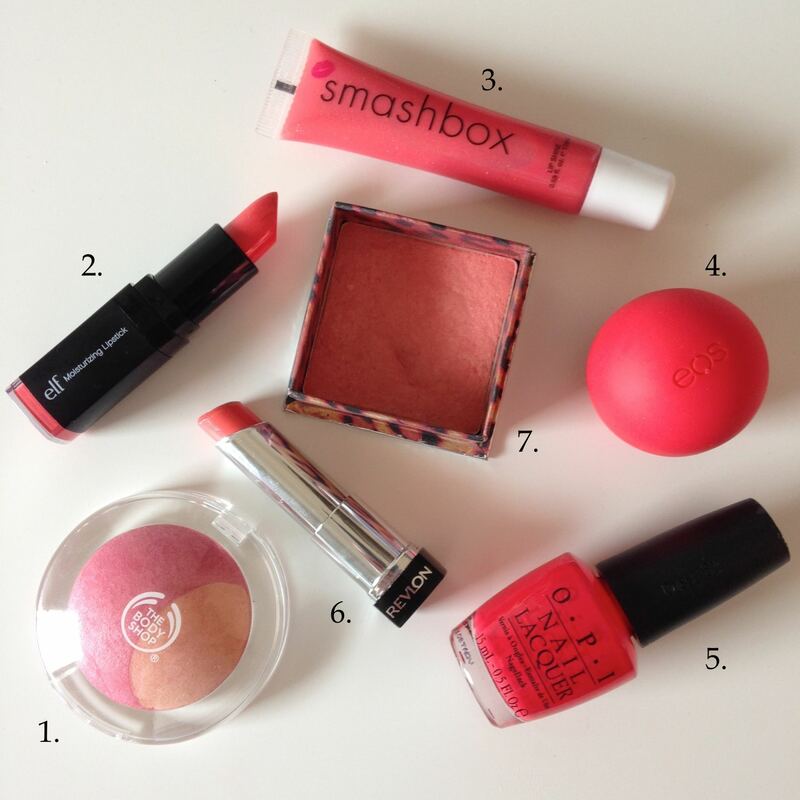 Coral is a color that looks great on just about anyone! It’s the go to color for summer, so here are some of my favorite color picks you might want to try! 1. The Body Shop Baked-To-Last Blush in Coral: This blush is super highlighting and gives a pretty flush to the skin. 2. e.l.f. Studio Moisturizing Lipstick in Coral Cutie: This lipstick is right on trend with the coral/orange statement lip. 3. Smashbox Lipgloss in Melon Drama: For a gloss, this is super pigmented and has a pretty gold shimmer (it has also been repackaged since I purchased it). 4. eos Lip Balm in Summer Fruit: While the product itself isn’t coral, it does have pretty coral packaging and smells super fruity! 5. O.P.I. Nail Polish in Cajun Shrimp: This is my go-to summer color. It’s bright and long lasting. 6. Revlon Coloburst in Juicy Papaya: This is probably my favorite Revlon lip butter. It is natural but gives the perfect hint of coral to the lips. 7. Benefit’s Coralista: This was my first boxed blush, and it shows! It is a classic coral and ever so slightly scented! What are your favorite corals? Let me know!